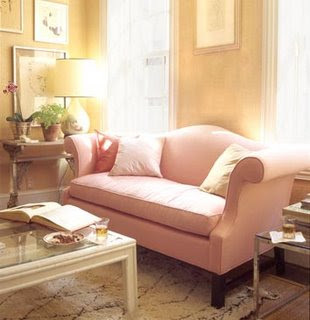 I love this pretty pink and yellow room which Anastasia posted on her gorgeous blog Anastasia Drawing & Dreaming. This became one of my April Domino tear sheets. Looks like it might be another Sarah Ruffin Costello room -- the art and lamp look like pieces from that robin's egg blue loft. Oh I love this couch, I posted it on my blog too, as soon as I got it. I just gazed at it and in my mind, designed an entire dream apartment just from that little corner! I just discovered your blog too, I love it and I will most certainly come back! Ohhh thanks for the mention!